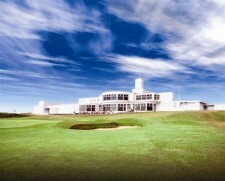 SOUTHPORT IS THE IDEAL LINK TO ENGLANDS GOLFING CAPITAL. WITH SEVEN CHAMPIONSHIP AND MANY MORE QUALITY COURSES NEARBY, WHY NOT MAKE US THE NEXT VENUE FOR YOUR GOLFING BREAK ! We can cater for small/medium golfing parties (up to 16) in a combination of triple, twin, single, and double (reasonable single suppliment available) rooms. We are ideally situated near all the top courses- Royal Birkdale, Hillside, Southport and Ainsdale, Formby, Formby ladies, West Lancs, Hesketh, Royal Liverpool (Hoylake) Southport Old Links to name a few. We are also perfectly located for nearby courses in Preston and Ormskirk for those on a more restricted budget but still wishing to enjoy quality golf. Please email your enquiry via the contact link provided top right of screen.